The one thing I’ve learned (well, there have been several over the years, but this lesson stands out to me today) is that while cooking and baking, learning to adapt is the key to being successful! 1 cups diced sweet potatoes, boiled in lightly salted water until tender. Drain and keep warm. -In a medium sized pan over medium/high heat, cook the apples in the water until softened and the water has evaporated (approximately 15 minutes). -Reduce the heat to low and stir in the salt, cinnamon, nutmeg, maple syrup and butter. Cook for approximately 5 more minutes. Remove from heat and keep warm. -Stir in the nuts (if desired) and serve warm, on top of the pancakes. -In a large bowl, mash the cooked sweet potatoes. -Whisk in the milk, eggs, flour, baking powder nutmeg, cinnamon and 2 tablespoons melted butter. -In a large skillet over medium heat, melt a little butter and then add the sweet potato batter. -Cook until bubbles form. Flip and cook the other side until browned. Remove pancakes from the skillet and keep warm. -Continue the same process with the remaining batter. 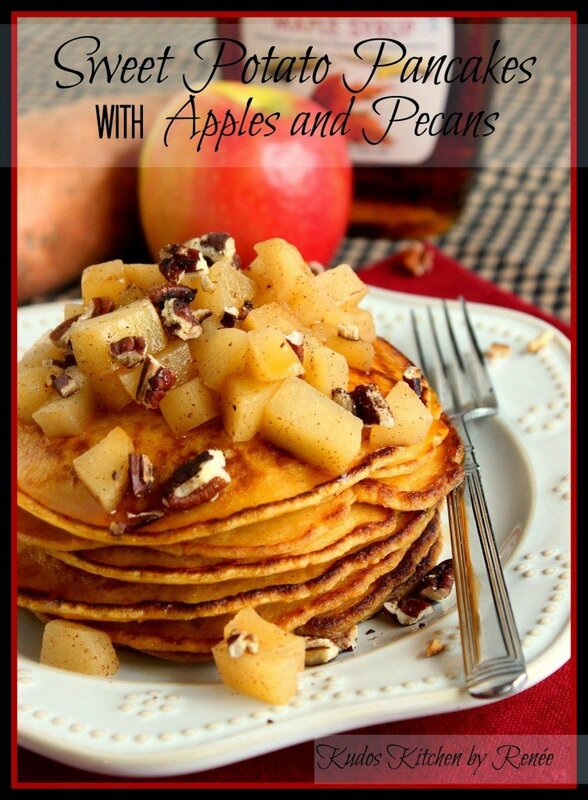 -Serve the pancakes with the apple and pecan topping and additional maple syrup if desired. Now that I’ve divulged my deep, dark secret of how I messed up this recipe, but in the long run came up with a a dish I was very please with, and that had great flavor…Tell me, has this kind of thing ever happened to you in the kitchen? And what was the mishap that led you to a wonderful new recipe in your kitchen? Inquiring minds want to know! LOL. Want to see more great recipes from group D of the #SRC members for the month of June? Just click on the photos below and feast your eyes on what they’ve cooked up for you this month…I hope you’re hungry!!! they would turn a breakfast into something super special! Wonderful choice for your assignment! Ha ha, All's well that ends well. Trust me the secret to successful cooking is going through many a disaster. Glad you enjoyed them finally. Oh I would love to make these!! They sound absolutely wonderful!! This has happened to me a bazillion times. My culinary teacher used to say "make it work", and so you did. Beautifully. What a great way to serve pancakes! These look AWESOME!! I've made pumpkin pancakes, but never sweet potato… I will definitely have to try this! Looks like you chose wisely this month! Looks like a lovely and delicious breakfast! 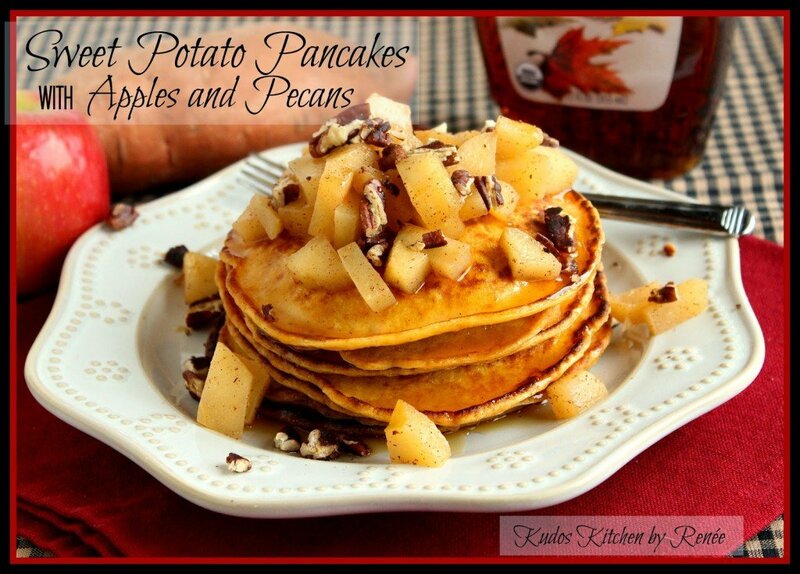 We make sweet potato pancakes and apples all of the time! These look fabulous! This looks terrific! I'm all about fruit/veges in bready things these days. Can't wait to try it! Wow. That looks so delicious. I'm definitely trying these! Since I love every single one of these ingredients I know I would love these pancakes. Pinned! Happy Reveal Day! Oh heavens, these crepes look amazing. What an amazing choice for the SRC! This looks like a wonderful breakfast! Great SRC pick! 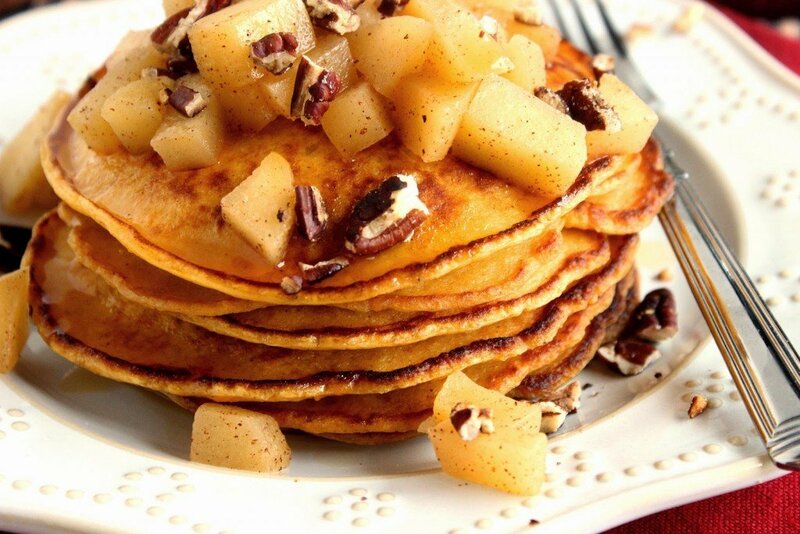 Great recovery from potential disaster 🙂 Loving the combination of sweet potato with apples and pecans – beautiful looking pancakes. I was lucky enough to have Shirley's blog last month and I had looked at this same recipe LOL. I just want to say that I LOVE all the artwork on your blog…it has to be the prettiest I have ever seen. Where's my fork???? These look amazing. Great pick this month, SO going to try these! Your pancakes still turned out beautiful! I absolutely love your photos. I don't have any great recovery stories recently. My failed attempts usually end up in the trash. Great job! I love those crispy little pancake edges! These sound like they could be breakfast on Sunday!! I sure hope you saved me a stack because I'm heading over right this minute. Oh wow. I this is making me hungry right now for pancakes really late at night. This is simple perfect. Loving the flavor combination and contrast of textures too! I bet my son would love these pancakes!